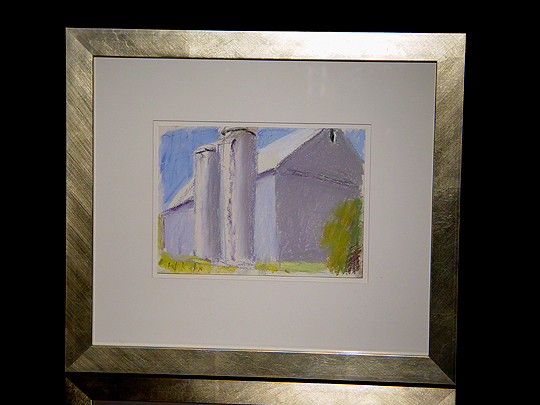 PASTEL ON PAPER, 7 1/2" BY 9"
In addition to the forest scenes for which he is perhaps best known, Wolf Kahn is also very well known for his series of works (in both pastels and oils) that depict barns. Barn With Double Silos is somewhat similar to my first Kahn, Acacia (Namibia), in its use of color... that's one of the reasons I really like this work. I also like the way in which Wolf has contrasted the precise architectural lines of the barn and silos with his own unique brand of "fuzziness"... in Wolf's paintings, there's almost never anything that's in focus. That's part of why they work so well, I suppose.